The combination of rich chocolate, gooey marshmallows and crispy graham crackers in s’mores is one of the most delicious food trios out there as far as I’m concerned. I’ll take any excuse to whip up a batch of s’mores and nearly always have the basic components on hand in my pantry. The bonus of having these things on hand is that I’m always ready to play around with variations on a s’more by playing with the components in different formats. 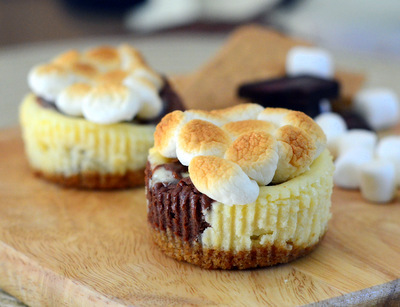 These S’mores Mini Cheesecakes are the delicious result of a little bit of culinary experimentation and they’re a fantastic new way to enjoy those classic s’mores flavors. The mini cheesecakes have a graham cracker crust topped with a swirl of vanilla and chocolate cheesecake batter that is finished with a topping of toasted marshmallows. The tang of cream cheese gives these little desserts a decadence that you won’t find in your basic s’more, but you still get the graham, chocolate and marshmallow in each bite. For the chocolate portion of the cheesecakes, I used a blend of milk chocolate and dark chocolate. Dark chocolate has a deeper cocoa flavor to it that really contrasts with the vanilla flavor in the plain cheesecake batter, however s’mores are typically made with milk chocolate, so a blend of the two creates a nice balance. I only gently swirled the two batters together in the muffin cups so that there would be a lot of color contrast in the finished cupcakes. It is worth noting that if you are aggressive with your stirring, your graham cracker crumb crust could get a bit shaken up, so swirl carefully with a thin knife or a toothpick. When the cheesecakes are done, cool them completely in the refrigerator before topping them with marshmallows. I used mini marshmallows, but you could use large marshmallows (cut in half) or even marshmallow creme. I toasted mine with a kitchen torch, which is very handy for finishing off small desserts, however the cheesecakes can also be slid under the broiler for a minute to toast the marshmallows without losing much of the chill of the cake. The cheesecakes are baked in mini muffin tins – or mini cheesecake pans, if you have them – so they are the perfect single-serving size that you can enjoy in a few bites. They keep well in the refrigerator, though the marshmallows need to be added at the last minute before serving, so they can be prepared ahead of time if you want to serve them to a crowd of s’mores lovers at the end of a meal. Preheat oven to 350F. Line 10 cups of a muffin pan with paper liners. In a medium bowl, make the graham cracker crust. Mix together graham cracker crumbs, sugar, cinnamon and salt and stir to combine. Pour over melted butter and stir with a fork to moisten the crumbs. Place about a tablespoon of crumb mixture in each of the prepared muffin cups and pack down into an even layer. In a large bowl, make the cheesecake. Cream together cream cheese, sour cream and sugar until smooth. Beat in the egg and vanilla extract. In a medium-sized, microwave-safe bowl, melt the dark and milk chocolate. Add in 1 cup of the cheesecake mixture and stir until all of the chocolate has been completely incorporated. 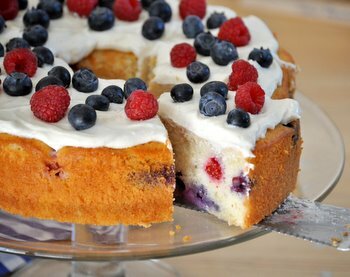 Bake for 20-24 minutes, until cheesecakes are set. Allow to cool completely in the muffin pan, then carefully transfer cheesecakes to a platter – cheesecakes will still be quite tender – and refrigerate until well-chilled. 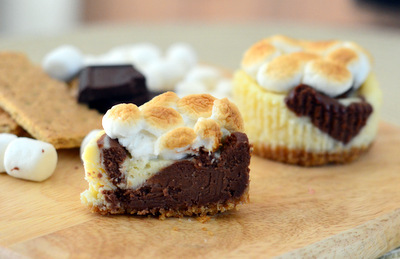 To serve: Top each chilled cheesecake with 7-8 mini marshmallows or 1/2 large marshmallow. Toast the marshmallow until golden brown and serve immediately. These cheesecakes look so cute! And delicious! WOW! That looks amazing! I could go one of those right about now 🙂 Love the toasted marshmallows.